Welcome to our martial arts dojo site. We are located in north Scottsdale, Arizona (not far from the airpark), and serve metropolitan Phoenix, Arizona. We practice Chulukua-Ryu, Jiu Jitsu and Karate, primarily, with a focus on self-defense. the evening of September 10, 2013.
we are full of gratitude for the time we had with you. We send our prayers for your transition to whatever is next for you. Derived from Japanese, it is also spelled Ju Jutsu or Ju Jitsu. Ju means 'gentle', 'soft' or 'flexible' and Jutsu means 'skill' or 'art.' Hence Jiu Jitsu is the flexible art. This unarmed martial art either originated in or found its way to Japan over 2,500 years ago. It focusses on striking vital points, locking joints and throwing opponents.The vital points that are targeted in many martial arts are the same pressure points that are used in healing techniques such as acupuncture. The ability to strike pressure points accurately can be lethal, so this knowledge is taught gradually as the student progresses in skill and control. In addition to striking pressure points, our study of the martial arts - and Jiu Jitsu in particular - will teach you wrist locks, arm bars, take downs, throws, mat holds and choke holds. 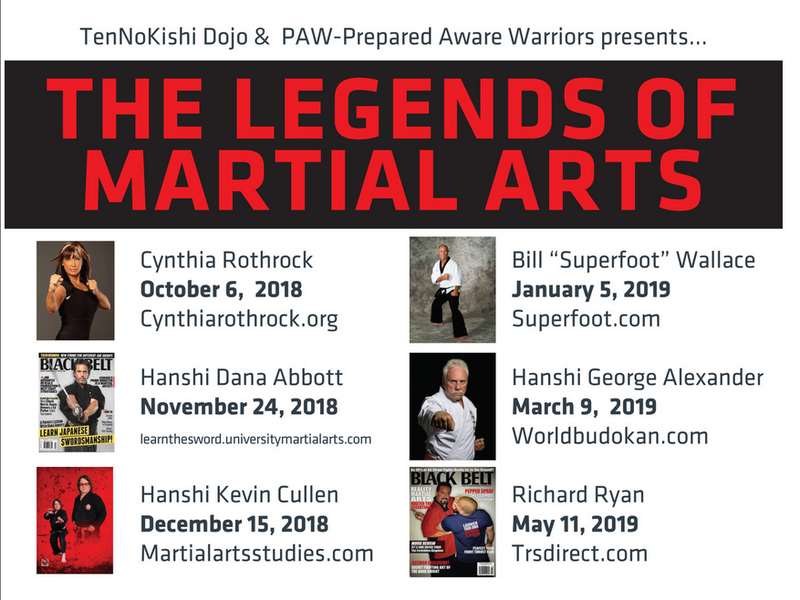 From dealing with intimidation, to handling crowd control, to protecting yourself in a life-threatening situation, this martial arts system will give you the tools you need to face life with increased confidence. I come to you with only 'Karate' - empty hands. I have no weapons, but should I be forced to defend myself, my principles or my honor; should it be a matter of life or death, of right or wrong; then here are my weapons - 'Karate' - my empty hands. The history of Karate is strongly intertwined with the history of Okinawa, the largest island and capital of the Ryukyu Islands chain, which links the main islands of southern Japan to the island of Taiwan. An interesting influence in the development of Karate was the banning of weapons on Okinawa in 1477. The origins of Karate, however, go back thousands of years, perhaps even to the famous Shaolin Temple (China), often credited as the birthplace of the martial arts. In our dojo, the practice of Karate teaches basic stances, punches, kicks and blocks. Kata (Japanese for 'form' - a series of choreographed moves designed to simulate combat with multiple opponents) are practiced extensively to ingrain combinations of the basics into our bodies. Defense sets and weapons are introduced to upper yellow belts in preparation for the orange belt test. More advanced kata, defense sets and weapons exercises accompany the advancement in belt rank. 6th Rok-Kyu Orange Spirituality & Awareness to develop "Ki"
starting with ShoDan (1st degree), and going up to JuDan (10th degree). Currently Ten No Kishi Dojo is a private dojo. Ocassionally workshops are offered to the public. Please contact us for answers to any questions you may have. For information about classes, disciplines, and other general questions: . We invite you to visit the Deer Tribe Gun Club, also run by Soke Reagan as part of his commitment to providing complete self defense instruction. We also invite your on this site. by Howard Reid and Michael Croucher.